You are here: Home / Blog / What Size Generator Do I Need? Common questions people ask: What size generator do I need? How big of a generator do I need? Generator sizing is a source of confusion for a lot of people so don’t feel bad if you’re unsure which generator you need. It can be confusing, which is why we created this article. We packed this article with useful advice to help you answer your question: What size generator do I need? We rely heavily on electricity to power the things that get us by on a day to day basis (unless, of course, you’re Amish) so there may come a time when you’ll need an alternative source. If you’re thinking of getting a generator, one very important question you must ask yourself is ‘what size generator do I need?’ Generators come in a wide range of sizes and are capable of powering up different things. As you can expect, the bigger the size the higher the price so before you go out and blow all of your dollars on a generator, you should determine what size would be most suitable for your needs. It’s a common question that every homeowner asks himself before making their purchase. Don’t get me wrong, it’s a good question. You should be asking yourself what generator size you actually need — not want, but need. We hope you find this article useful. We aim to give you information that you can use so you don’t waste your time and money. Can run 5.7 hours at 50% Load — and 7.7 hours at 25% load. View brochure. What will you be using your generator for? A generator’s size goes by wattage as in the amount of power it can put out. When you’re looking to find what size generator you need it all depends on the intended usage. What are you needing it to run? Is it for just emergency use or will it be used more frequently such as for recreation? There are several factors that you will need to take into account to ensure the generator you choose is the right one. A portable generator may be sufficient for running a couple of small appliances or power tools but if you’re looking to power up an RV you might need some serious power. What generator do you need? You will have to also figure the amount of watts that the devices you’ll be running use, which may require you to do some math. FYI – the number wattage that is listed on the appliance is not an exact representation of the amount that it takes to run it. For instance, a 900w microwave simply means that’s how much power the microwave itself puts out. The key point to remember is that a device will always require more power to run than the amount of power it puts out. This is where the math comes in! If you need to figure exactly how much wattage your appliances require, look at the data tag by the manufacturer. This is the tag on the unit that lists volts, amps, horsepower, cycles, phase, etc. Most often, appliances list their power consumption in amps rather than in watts. In order to get the watts the device requires to run you simply multiply the number of amps by the number of volts it lists. Another factor you will need to calculate is the starting wattage. What this means is that some appliances, such as those that contain an electric motor, require more watts to start up than to actually run. These include refrigerators, air conditioners, power tools, air compressors, well pumps, and furnace fans to name a few. To calculate the starting watt requirement, with most appliances it is generally 2 to 3 times more than the running watt requirement. The majority of homeowners can power most household appliances with a generator between 3000 and 6500 watts, depending on what you need to power. The true answer lies in the specifics of your electrical demands. If you live in a home with a small furnace and city water, then a 3000-5000 watts generator will likely suffice to power your needs. On the other hand, if you have a larger furnace and/or a well pump, you should aim for generator between 5000 to 6500 watts. Generators come in wide range of sizes, fuel types and prices. Determining your budget in relation to your needs are essential to figure out before making your final decision. What size Generator Do I Need for a Power Outage? Thunderstorms affect everyone and from time to time it may cause a power outage. It can be for a few moments or sometimes for hours before it comes back on. A generator can save your food from spoiling or run a window A/C unit to keep you comfortable until it does. If you’re looking for a generator for the occasional power outage you don’t need anything monstrous in size. Consider what you would absolutely need to run in the event of a power outage. You will most likely want to run your refrigerator for to ensure you don’t lose all of your food. What else might you need to run during a power outage? The microwave? A radio? For the average fridge and a couple of small appliances a generator within the 2,000 -3,000 watt range should suffice. Now if you have a window air conditioning unit or a space heater you are needing to run in addition to your fridge then you may need to up the power output of the generator selection. Good balance between price and power output. In the event of a natural disaster, such as a hurricane, you could be left without power for several days. A smaller generator may get you by for a few hours but when it turns into days you can be left in a bind. Think about the appliances you use every day – a hot water heater, a washing machine, an electric range! A larger portable generator can be easily equipped with a manual switch that will convert over to the generator’s power when you lose electricity to run essential appliances. What size Generator Do I Need for Whole House Backup? You will need to look at the power consumption and calculate about how many watts each appliance requires (including the starting requirements) in all to be run for instance: to run a central air unit, refrigerator, electric washer and dryer, and an electric water heater you need something that is at least between 10,000 running watts to 18,000 maximum starting output watts. Keep your entire house running even when disaster strikes. A standby generator can power up your entire house so there is no disruption to your life and you can go on as you normally would – running your dishwasher, blow drying your hair, etc. These can range in size from about 22,000 running watts and up. The beauty of a standby generator is that it will automatically switch over during a power outage so if you’re not home when the power goes out, there are no worries. The size you need will depend on the size of the home. Your best bet is to get an estimate based on your needs from a distributor that provides them. What Size Generator Do I Need for Recreation? Suppose you want to travel or take a weekend getaway from time to time. Whether you’re road tripping or just planning a fun camping outing with your family some of the essentials you packed along may require the use of electricity. For instance, let’s say you’re camping in a tent but want to have something that can power a coffee maker, an electric grill, and your phone. A small portable generator of between 1,000 – 2,000 watts would more than suffice. If you prefer to go camping a little more comfortably in an RV instead factor in the heating or cooling of the RV as well as any additional appliances you may be running. For instance, to run the air conditioning, a small refrigerator, a microwave and small television or DVD player consider something between the 2,500 – 4,000 watt range. What Size Generator Do I Need for Work? Many contractors and those who work in construction require the use of portable generators to power up their tools when electricity is not available. This will largely depend on the type of tools you are running for the job site. If you primarily work on your own and just need a portable generator for small power tools, a generator within the 2,000 watt range should be accommodating. Keep in mind what you will be using simultaneously as you won’t need as powerful a generator for running just one power tool at a time. A larger crew that needs to run an air compressor, a circular saw, and an electric edger, on the other hand, will need something a little more powerful. Bigger tools that run at the same time will need more power so a generator ranging in 4,000 – 6,000 watts may be adequate. An robust mid-power portable generator for work or emergency power. When you’re looking at generators and trying to determine ‘what size generator do I need’ you may be thinking that bigger is better. Not necessarily. While it’s important to make sure your generator will stand up to your needs in terms of power, you don’t want to overestimate. A bigger generator can be much more cumbersome to carry out of the garage during a power outage if all you really need is to preserve the food in the fridge. They also get higher in price with the higher wattage output so also keep your budget in mind when factoring what size you really need. Many appliances and power equipment require an extra burst of power when first starting, but some electrical devices do not need extra power when first started — they simply use the same amount of power throughout, from starting until you turn them off. An electrical load is an electrical component or portion of a circuit that consumes electric power. This is opposed to a power source, such as a battery or generator, which produces power. In electric power circuits examples of loads are appliances and lights. The term may also refer to the power consumed by a circuit. Briggs & Stratton P3000 | Great for camping, RV’s and other outdoor activities. Resistive loads are easy to understand; these devices require the same amount of power to both start and run the equipment. Resistive loads means that no motor is involved and another characteristic is that no magnetic fields are involved. Typically, resistive devices are electrical heaters and incandescent lighting. An electrical device has an electrical motor it draws a reactive load. The motor is what requires additional power to start, but once it’s running, the power requirements drop significantly, and so, the power needs drop to keep it running. Typically starting power is 3 times the amount of power to run the application. Check the rating in the manual for your specific devices. Some household appliances, tools, computer equipment, furnaces or refrigerator, have internal fans that automatically turn on intermittently, but consistently. Extra wattage/power is needed to start the fan each time. Refrigerators also have a defrost cycle that uses extra power, in addition to the compressor and fans. Reactive loads may also require additional power when the electric motor begins to work. For example, when you start felling a tree with your electric chainsaw, its power requirement will increase as the chainsaw is actually being used. This is not true for most household appliances though, but you should be aware that as the demand on certain devices increases (like a chainsaw), so does their power load. To accurately answer the question, “How big of a generator do I need?” you need to know the power load of the electrical devices you want to power. You don’t need to guess. It’s always better to have a higher powered generator than one that won’t provide you with enough juice. In the case of generators, more power is always better, especially if you want to prepared in case of an emergency. My appliance is a 1200 watt model, but it requires 1600 watts to run, why? Some devices are labeled or promoted with a power number. For example, a hair dryer might say “1200W.” This means the hair dryer actually produces 1200 watts of heat energy, but, the amount the energy the hair dryer uses from your power outlet is always more than it creates in heat. The reason is simple: Sometimes the electrical device is not 100% efficient in the energy it uses. Another example is a microwave oven. It may be marketed as 1400 watts but it will require more power from a generator because it requires more power to run than it actually provides. Yes, it still produces 1,400 watts of power but due to inefficiencies in the system, some energy is lost in translation. Maximize the power of your generator with this heavy-duty adapter. Small Generator — 3,000 to 4,000 watts. 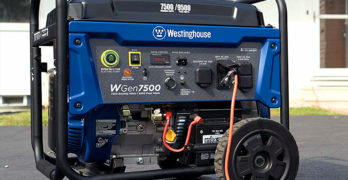 A portable generator is only one aspect of preparing for a major power outage or an emergency like a natural disaster. Nature is unpredictable and some parts of the world are more prone to disasters. The first thing you need to do is evaluate where you live. What are your potential threats? For example, if you live in Seattle, a major earthquake is entirely possible and probable in the near future. For long-term emergencies you’ll need more than a generator. Every home needs a carbon monoxide monitor. This one is modern. When power outages occur after severe weather (such as hurricanes or tornadoes), using alternative sources of power can cause carbon monoxide (CO) to build up in a home and poison the people and animals inside. Carbon monoxide (CO) is an odorless, colorless gas. It’s formed during incomplete burning of fuels, such as gasoline, kerosene, natural gas, oil, coal, or wood. Every year, at least 430 people die in the U. S. from accidental CO poisoning. Change the batteries in your CO detector every six months. If you don’t have a battery-powered or battery back-up CO detector, buy one soon. CO is found in fumes produced by portable generators, stoves, lanterns, and gas ranges, or by burning charcoal and wood. CO from these sources can build up in enclosed or partially enclosed spaces. People and animals in these spaces can be poisoned and can die from breathing CO. The most common symptoms of CO poisoning are headache, dizziness, weakness, nausea, vomiting, chest pain, and confusion. People who are sleeping or who have been drinking alcohol can die from CO poisoning before ever having symptoms. Never use a gas range or oven to heat a home. Never use a charcoal grill, hibachi, lantern, or portable camping stove inside a home, tent, or camper. Information from the American Red Cross. This includes inside a garage, carport, basement, crawlspace, or other enclosed or partially-enclosed area, even with ventilation. Opening doors and windows or using fans will not prevent CO buildup in the home. The CO from generators can rapidly lead to full incapacitation and death, but CO can’t be seen or smelled. Even if you cannot smell exhaust fumes, you may still be exposed to CO. If you start to feel sick, dizzy, or weak while using a generator, get to fresh air RIGHT AWAY – DO NOT DELAY. Because you may have windows open to get fresh air while the power is out, be sure to place the generator away from windows, doors, and vents that could allow CO to come indoors. To avoid electrocution, keep the generator dry and do not use in rain or wet conditions. To protect the generator from moisture, operate it on a dry surface under an open canopy-like structure, such as under a tarp held up on poles. Do not touch the generator with wet hands.